I’ve always held a fascination for croc skin. From perceptible to borderline imperceptible textures, it’s the detail and refinement that goes into a croc skin product (be they shoes, wallets, belts or bags) that turns me on (in an emotional sense. I’m not a pervert). That said, even though these Yves Saint Laurent men’s shoes (specifically Chukkas) are faux croc nevertheless these croc skin facsimiles are still a beauty. “How have you managed to preserve yourself so long and so well?” asked Augustus of Pollio. “With wine inside, and oil outside,” responded the old man. The Romans were the first hedonists and they knew how to appreciate the good life. If Croc-skin is good enough for the Romans, it’s good enough for me. 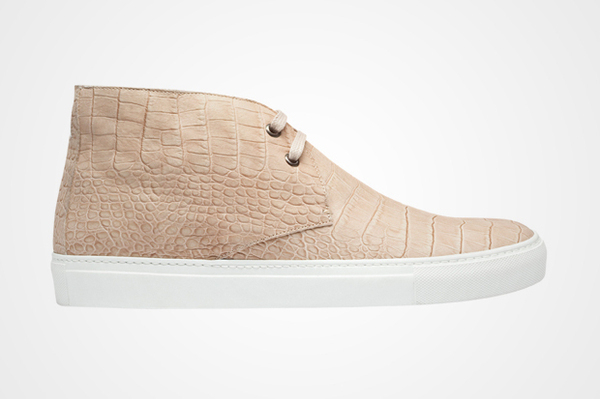 This Spring Summer 2011 sees Yves Saint Laurent introducing crocodile skin chukka into its footwear selection. Available in both tan and grey, while both exceedingly gorgeous, it’s the contrast of tan embossed faux-croc upper against white outsole that makes this colour choice the perfect designer men’s shoe for your timeless wardrobe. While I feel the Chukka type shoe is more trendy than timeless, I’m more than willing to make an exception in this case. The shoe can be purchased through select retailers though I wouldn’t count the more astute shopper to put these puppies on eBay for resale out just yet. Here’s a men’s style tip on wearing Yves Saint Laurent Croc skin shoes Try this combination on for size: V-neck tee, cardigan and slim cut denim jeans with the cuffs rolled up just enough to expose the Chukka silhouette.